Come ﬁsh the magic waters of San Carlos. 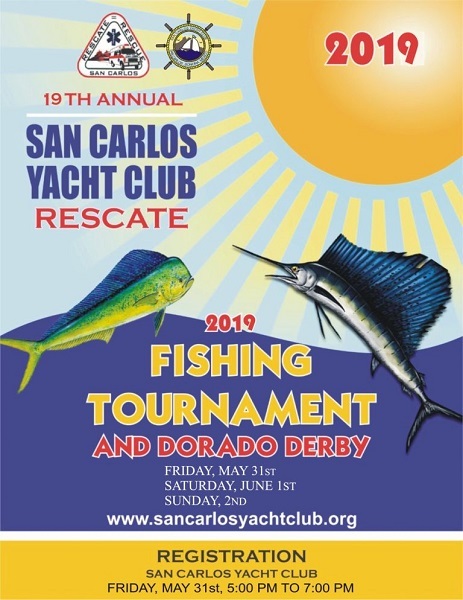 The 2019 Yacht Club / Rescate Fishing Tournament will take place from May 31 to June 2. It promises to be a fun time, as always, with lots of prizes including new daily angler awards. This is an event where a lone angler could enter and for no more than the entry fee walk off with several thousand dollars in prize money. There are Daily Angler Awards and both Fun Fish Jackpots and regular Jackpots. The entry fee is $150 USD per angler (there’s no boat fees). Other buy-in jackpots are available. Anglers who pre-register before May 18 can have their boat name on the sleeves of the special fishing long sleeve T shirt. Pre-register here. Read the complete 2019 Tournament Rules here. Get your fishing licence online here. Registration: Tournament Registration and Cocktails at the San Carlos Yacht Club on Friday May 31, from 5:00pm to 7:00 pm. The Tournament Committee will be available at Registration to answer questions. A Captains Meeting will follow at 7:00pm. Saturday, June 1, fishing starts at 7:00am and ends at 4:00pm. Sunday, June 2, fishing starts at 7:00am and ends at 3:00pm. The Awards Dinner will be held at the San Carlos Yacht Club Sunday Evening, June 2. The bar will open at 6:00pm with dinner at 7:00pm and Awards after dinner. 2nd Place El Patron – 3450 points. 19 boats competed in the 2016 San Carlos Yacht Club Rescate Fishing Tournament. Telamon won (congratulations Bryan Replogle), Predator came in 2nd and Kryptonite in 3rd. Telamon pulled off a close victory by a few fish over Predator with 25 releases. Most boats had pretty good fishing, with a few dorado to eat. Some 20 – 25 pound dorado were caught, with some losing a couple at 30 pounds. With temperatures in the low 90’s and flat seas to start, the two day fishing tournament was a resounding success. Boats came from Navojoa and Hermosillo in Sonora and as far away as California and Colorado, with many “local” fishers from Arizona taking part in addition to local San Carlos boats, some of whom were first-time entrants. 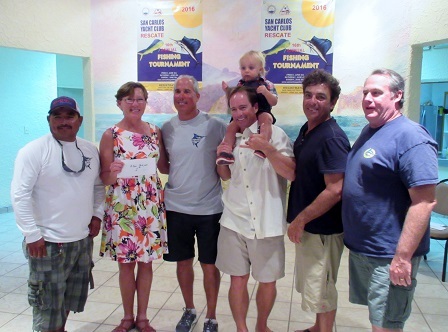 Overall winner was “Reel Mistress” with a total of 21 Billfish released for the two days. Overall second was “Telamon” with a total of 12 Billfish released for the two days. Overall third was local boat “Kryptonite” with a total of 9 Billfish released. 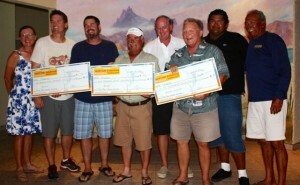 1st: Pay It Forward; 2nd: No Limit; 3rd: Cortezano for $300 jackpot Billfish division. 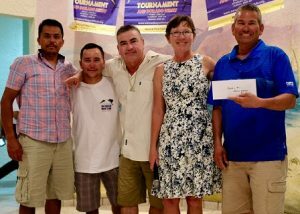 There were 55 anglers competing for a variety of prizes in particular, the first released Billfish each day was worth $500 US to the lucky angler. Ironically, the same person managed to win both days! – Ken Diaz, on Telamon – Congratulations! 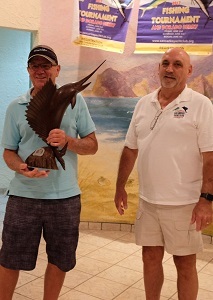 The largest fish in the “fun fish” category was awarded to Mike Wusterbarth on Margarita IV for Saturday’s award, and to Pedro Almada on the boat Tres Mitades from Navojoa for Sunday’s award. Other winners were Margarita IV – Dorado division. After a high spirited awards ceremony, many boats donated extra money to Rescate, thereby helping even more towards the various life-saving endeavors of our local service. 102 anglers in 27 boats competed in this year’s Rescate / Yacht Club Fishing Tournament. Lucky Ducks: owner Steve Fusco with 4 anglers and boat captain Rafael Fimbres with 469.6 points. DiBecca: owner Dave Butrum with 3 anglers and boat captain Sunny with 300 points. Kryptonite: owner Wade Earl with 4 anglers and boat captain Juan Gastenau with 300 points.